Vitrectomy Face-Down Recovery Equipment Mobility + Neck Pain Relief! Recover with Pain Free Mobility, NO ASSEMBLY REQUIRED!!! OF HOLDING YOUR HEAD IN THE FACE-DOWN POSITION. Do you get even the slightest touch of claustrophobia when closed into one position for any length of time? Most people find the recovery period torturous, much more so than the surgery itself. 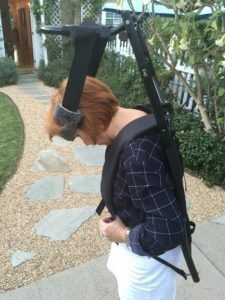 Designed to help my wife PHYSICALLY AND EMOTIONALLY make it through her required days of face-down recovery, the FaceDownWalker® TAKES AWAY THE NECK PAIN AND SAVES YOU FROM BEING TRAPPED in one position for several days. It helps make the recovery period as comfortable and bearable as possible. Holding your head in the face-down position causes pain to build up in your neck, even when sitting in a massage chair and/or on a doughnut-shaped pillow. The forehead pad on the FaceDownWalker® takes all of the weight of your head off of your neck. You may sit on most of your own kitchen chairs, hard-backed chairs, stools or ottomans for a virtually neck pain-free recovery period. If needed, add a cushion or two to a chair to make it more comfortable to sit on. Plus you can move about your home. Movement is so important to maintain blood flow to help prevent blood clots from forming in your legs which can lead to a collapsed lung or stroke. If you can bend your neck to look at the ground while standing and fit at least three fingers on your forehead over your eyebrows, then the FaceDownWalker® will take away the pain in your neck from having to maintain the face-down position during the many days of your recovery period, even if your not really interested in walking around. The face-down position creates an excruciating strain on your neck and upper body muscles. My wife underwent Vitrectomy surgery to repair a detached retina. For the recovery period of ten days, she was instructed to remain in a face-down position all day and night. After two days of this regimen she was overwhelmed by the pain in her neck & back, pain from sitting on the pads of the massage chair as well as her face hurting from being on the doughnut pad of the chair and bed pillow. Claustrophobia and depression set in. There was a real concern about developing blood clots in her legs as she had a pulmonary embolism resulting in a collapsed lung a year before. My response to help her in this situation was designing the patent-pending FaceDownWalker® mobile support system. A normal head can weigh up to 11 pounds! Your neck is not designed to hold it in the face-down position for any significant length of time. FaceDownWalker® relieves the strain on your neck and the rest of your upper body muscles. The forehead sling of the FaceDownWalker® comfortably transfers the weight of your head to the backpack. Unlike most doughnut-shaped pads, the forehead sling relaxes the muscles in your neck, chin and back while allowing mobility for supervised, relatively pain-free extended periods of time. THIS IS YOUR EYESIGHT! You want to stay compliant with your doctors' orders to keep your head in the face-down position to achieve the best possible outcome. It is important for your body to change positions and move during recovery. You can and will get through this. Read the testimonials of people who did, thanks to the help from the FaceDownWalker®. click on the box "Add to cart"
Fill out the form with your name, address, etc. then fill in "ship to different address" info if sending somewhere other than your billing address. OR HAVE A COMPANION WITH YOU TO HOLD YOUR HAND WHEN YOU WALK AROUND. YOU MAY STAND, SIT IN MOST CHAIRS & WALK AROUND YOUR HOME. IF NEEDED ADD A CUSHION OR TWO TO SIT ON WITH CERTAIN CHAIRS. ©2019 See Recovery Solutions, LLC. All Rights Reserved.